← If Obama’s Libyan Intervention “Succeeds”, Will Palestine Be Next? I have been studying an excellent documentary, Occupation 101, an examination of the root causes of the Israel-Palestine conflict. The case of Judge Richard Goldstone broke too late to make it into the film, but I have a suggestion for the film makers: Start work on a sequel. Call it The Goldstone Affair: The Loyal Zionist Judge Who Came in From the Cold. On April 1, 2011, Goldstone wrote an op ed column for the Washington Post in which he offered a light clarification of the negative report of Israel’s 17-day 2008-09 military assault in the Gaza Strip. Goldstone’s Post mea culpa gave Israel’s current tribal leaders the opening they demanded, an opening which they are now exploiting to rewrite the script of what actually happened in the Gaza assault. The mea culpa, with clarifications that are skimpy in the extreme, brought public humiliation to Goldstone. It also warns any Zionist loyalist who enters enemy territory that there are consequences for disloyalty. The hasbara (public information/propaganda) specialists in the current Israeli government found a few morsels in Goldstone’s 500-word newspaper column to feed to the media and to appease American PEPs (progressive except for Palestine) who had been reeling for months over the detailed 552-page (including annexes) Goldstone Report. Those hasbara specialists, or someone, may even have suggested the column’s most effective line to Goldstone. It sounds more like a spin-doctor’s phrase than something that would have come from the computer of a conservative South African Jewish judge. The line the media seized upon is the one in which Goldstone, or whoever shaped the final version (a Post copy editor, perhaps?) was this: “If I had known then what I know now”. His shift is attributed to the findings of a follow-up report by a UN committee of independent experts chaired by Mary McGowan Davis, a former New York judge, and what is “recognized” therein about Israeli military investigations. Well, Goldstone and I have not been reading the same report. McGowan Davis is in fact deeply critical of those Israeli investigations — their tardiness, leniency, lack of transparency and flawed structure. Her report — stymied by lack of access to Israel, Gaza or the West Bank — contains no new information I can see that might buttress a change of heart. Cohen concludes that whatever it was that prompted the Goldstone column remains “a mystery”. Why did Goldstone do it? He knew his Zionist masters would manipulate his column for their benefit, not for his. Was he so naive about Zionist politics that he did not know that in the final days of the Gaza assault Israel was already preparing its hasbara (propaganda) campaign to counteract the international negative impact of the assault? Could he have missed this January 15, 2009, Ha’aretz news report, written by Barak Ravid, that revealed the government’s plans to prepare for the aftermath of its murderous assault on Gaza’s civilian population? The Foreign Ministry has created a special task force to prepare for the aftermath of the Israel Defense Forces’ Gaza operation. . . . . The working assumption is that Israel has suffered a blow to its image in the West in the wake of heavy civilian casualties in the Strip. Israeli officials believe after the fighting stops and foreign journalists are allowed entry into the territory that negative sentiment toward Israel will only grow as the full picture of destruction emerges. These tribal leaders know how to plan ahead. What they had not counted on was that the UN investigation of this destruction would be led by a South African judge with impeccable Zionist credentials. Unfortunately for Israel, he was also honest, a jurist who followed the facts as they emerged. The result was the Goldstone Report that brought world approbation, and possible criminal charges, against Israel’s leaders and its soldiers. Zionism’s hasbara operatives plugged that loophole by exploiting Goldstone’s devotion to Zionism. Leamas, betrayed, hoodwinked, terminally fatigued, is in a state of existential despair at the end of the novel. The opportunity to escape means nothing to him — but it does mean everything to him that the girl he is with, Liz Gold, innocent, unwittingly drawn into the Circus’s plotting — should escape. Leamas knows unequivocally at the end of the book that he is going to be betrayed again …. but he tries all the same to thwart that betrayal. Judge Goldstone’s fatal weakness is that the Zionism he loves is no longer the Zionism he once knew. 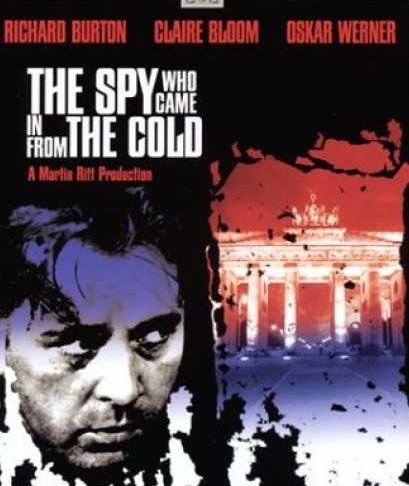 The British Secret Service that sent Leamas into the cold is also not the Service a younger Leamas signed up to serve. Leamas’ spy masters knew he would do anything to save the woman he loved. Goldstone’s Israeli minders knew what motivated him. His home and his family are in South Africa. His tribe is Zionism. The American Jewish publication Forward writes that when Goldstone returned home to South Africa last May for his grandson’s bar mitzvah — an event he almost missed because of protests planned against him — he also attended a secret meeting. The meeting was conducted by Avrom Krengel, chairman of the South African Zionist Federation. Krengel aggressively critiqued the Goldstone report at the meeting. Exactly, just as the British Secret Service knew their spy, so do Israel’s tribal leaders know their judge. Debating face to face with the community really shook him,” said David Saks, associate director of the South African Jewish Board of Deputies, who received a read-out on the meeting right after it took place. “When he saw the extent of the anger and he couldn’t answer the accusations against him… I think he realized he was wrong. In my American Southern White Protestant tribe, we would refer to this confrontation as Goldstone’s “come to Jesus” meeting. It is very rare that a judge would actually go back on a decision or judgement even if that was not a judicial act in the normal sense of the word. A mea culpa using an op-ed after a committee report has been submitted is extremely unusual. This is where the case becomes scary. Kuttab also reported that Goldstone was allowed to attend his grandson’s bar mitzva only “after the judge agreed to meet with the leaders of the South African Zionist Federation”. Whatever initially might have been right about Zionism as a movement, the Goldstone affair is a further indication that Zionism has been badly misused by Israel’s current leadership. It is often said that a wise man learns from the mistakes of others, while a fool learns from the mistakes of his own. Those who do not learn from their own mistakes confirm that insanity is repeating the same act while expecting a different result. In our case, this insanity is an insanity of persecution. Our belief that “the world is against us” has in recent years turned into a real obsession, a sense that we are constantly under attack, a fear of delegitimization, an insanity of persecution. It is unclear whether Israel is truly capable of differentiating between a real enemy and those who wish it well, or if it is simply complaining about being persecuted because it believes this serves its interests. It is not “good for the Jews” when a good man like Richard Goldstone is forced to come in from the cold to a Zionism that has betrayed him. The photo of Judge Goldstone is by Getty/Images. The photo of Meirav Michaeli is from Ha’aretz. When national and tribal loyalties become more important to an individual than the truth or justice, that nation or tribe, and the person submitting to them, are in moral decay. That’s what happened to Goldstone when the Zionist tribe demanded loyalty of him, insisting that he recant a truthful report in service to the tribe. He cowardly obeyed. Excellent analysis. It goes a long way to explain Goldstone’s “murky” retraction. At least he refuses to call for nullification of his Report. Jim: Your insightful and incisive comments is the first effort I’ve seen to give a plausible explanation of why Judge G. did what he did. It ‘s such a sad story — for him, for Israel, and for us (the rest of world). But we needn’t, and must not, let Bibi & Co. frame this subsequent discussion. Nothing has been heard from the three other authors of the report or from the authors of the other reports, all of whom could and should condemn the obfuscation and spin being applied to Judge G.’s mea culpa by the Bibis. This may require further criticism of him by his co-authors of the UN Report; so be it, if necessary. 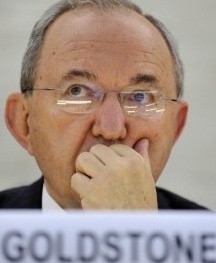 Meanwhile one can and should stop referring to the UN Report (full title) as the Goldstone Report. Jim, we are in your debt for your willingness to keep up with the details of a controversy and so much commentary, and for your ability to cut through to the heart of the matter and to write so clearly and incisively. Yet, at the risk of being trivial, I want to add one other note of clarification. I’d like to think that it was not simply nor even primarily tribal loyalty that led Goldstone to his letter of clarification. Rather it was a good man’s concern for truth and fairness — even though he knew and knows that that effort would be abused and misused by the tribe’s leaders and lackey’s. This is a perfect example of what can happen when one does not toe the ideological line, even though the “line” is full of myths. I grieve for Goldstone and all others who have tried to tell the truth and became sacrificial lambs. It is indeed sad to say the least. Bill Gephard is right–as far as he goes. I, too, am saddened that a judge has sold his reputation for a mess of pottage. But he and others who have tried to tell the truth and have become sacrificial lambs are not the big losers. All Israel is a loser, for it’s credibility has been utterly destroyed. And the patriots of Gaza and Palestine are the biggest losers. The settlers and other Jews who are intent on claiming what is not theirs have stolen the birth right of Palestinians and the Palestinian state and a gulible world stands around and appears to accept this tragedy. Fortunately for us, clear-thinking scholars and an increasing number of courageous [European] polititicans, see through this smokescreen. We need them all. While Israel seems to find comfort in the fact that Judge Goldstone no longer claims that Israeli soldiers deliberately attacked civilians during Israel’s 2009 invasion of Gaza, Israel continues to ignore an equally troubling but inescapable fact: Israel’s policy of confining 1.6 million poverty-stricken Palestinians in what is essentially a vast prison camp created the conditions that made the invasion necessary. Given the density of the population, vast civilian casualties were inevitable. It is difficult to see a great moral distinction between the deliberate targeting of civilians and a calculated indifference to the likelihood of civilian casualties. Either way, the victims are just as dead, and just as innocent. I love how you people complaining about one sidedness and favoring tribal and national loyalties over truth and justice, but do those exact things. When he said something you liked – you types rooted for him. But now when he says something you dont – you try to find hidden motives, not addressing what he says. It is not easy to listen to the other side, isn’t it. It takes time, takes effort and god forbids – you might say something your friends wont like. “Absolutely not; no process or acceptable procedure would invalidate the UN Report; if it does happen, it would be seen as a ‘suspect move”. Indeed, this is absolutely about justice and truth… lol.